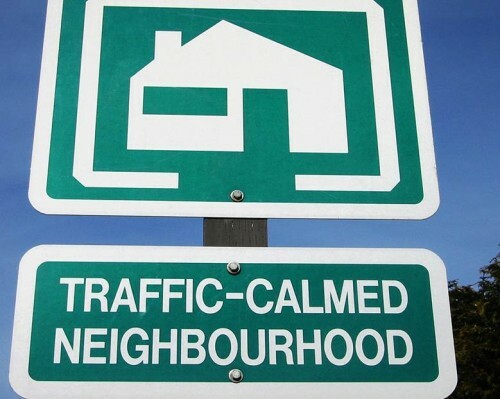 I am working with the City’s Public Works Traffic Engineering Department on a series of traffic calming pilot projects in several neighbourhoods of the South Winnipeg- St. Norbert Ward. My office receives countless phone calls and E-Mails on a regular basis requesting traffic enforcement to address speeding vehicles, and I am committed to working with community members and the Public Works Department to calm traffic in residential areas. Speed limit signs and traffic enforcement reduce speed and calm traffic to a limited extent. Traffic control and traffic calming devices are continually improving and in recent years, traffic engineers have been changing the ‘built environment’ to reduce speed and calm traffic. By changing the built environment, the physical changes alter vehicle/driver response to street conditions. Speed tables are a traffic calming device for use on collector streets to safely accommodate busses as well as emergency vehicles. They are designed to slow traffic to the posted 50 km/h speed limit. While traffic enforcement through the Winnipeg Police Service (WPS) can be effective, it is not sustainable. There is a high cost associated in sending out WPS enforcement and it provides only sporadic, temporary results. I am conducting these pilot projects which change the built environment, thereby requiring drivers to reduce their speed. Not everyone is supportive of traffic calming and I understand that. The implementation of these pilot projects is based on the professional advice of City of Winnipeg Traffic Engineers. Because I am not a traffic engineer, I rely on experts to provide advice and guidance, but please know it has been my initiative to conduct these pilot projects. Not every application works for every street and it is through pilot projects like the ones in our ward that engineers can learn and ultimately make improvements on a city-wide basis. I greatly appreciate the feedback which residents have E-Mailed into our office, as it has provided valuable information for these and other potential projects in future. The Dalhousie Avenue speed tables were installed in 2014, and are being monitored by the Traffic Engineering Department. This initiative was triggered as part of a national Safe Routes to School study. Overall feedback from residents, Ryerson School and the City of Winnipeg indicates the tables are successfully calming traffic and reducing speed. The speed tables on Aldgate Road were installed in Fall of 2016. Because Aldgate is a linear collector road, the speed tables were installed as ‘staggered’ tables. Slight modifications were made to the installation in 2017, and monitoring continues. With ongoing input from residents, the Public Works Traffic Engineering Department has concluded that “curb to curb” speed tables would be more effective on Aldgate. Curb to curb speed tables were installed in summer of 2017. Kilkenny is a linear collector street in a residential neighbhourhood. The staggered speed tables on Kilkenny were part of the 2016 road rehabilitation project, and were installed in Spring of 2017, due to a late completion date of the roadway construction. Information acquired through the Aldgate pilot project, combined with the collector route traffic on Kilkenny, have determined that the Kilkenny speed tables will be changed to the ‘curb to curb’ design. Bridgeland Drive North is also a collector street, though it is circular in design and collects vehicles from streets, bays and cul de sacs. This speed table was installed in Fall of 2016 to calm traffic on a section of Bridgeland Drive North. The speed table ALSO acts as a raised crosswalk and a link, connecting the large trail network in the neighbourhood of Bridgwater Forest. This first speed table has proven to be very effective, and four additional speed tables will be added on at Bridgland Drive North, and Bridgland Drive South in 2018 construction season. Three locations were selected for the installation of speed tables on Silverstone Avenue in 2017. The 1st location is mid-block between Kings Drive and Aurora Street; the 2nd location was put near the Community Centre to calm traffic in a potentially high pedestrian area; and the 3rd location is further west on Silverstone. A section of Pasadena Avenue (between University Crescent and Aurora Street) is a major cut through for outgoing University of Manitoba traffic. This section of Pasadena has been identified to receive a traffic calming device in summer, 2018. Lee Boulevard has become a thoroughfare for vehicles travelling from Waverley West. Until Bison connects to Kenaston, Lee Blvd will continue seeing increased levels of traffic. Speed tables will be installed on Lee Blvd in summer 2018. A speed table will be installed on Tim Sales Drive linking Jinnah Park to the pathway on the north side of Tim Sales Drive in summer of 2018. I am conducting these traffic calming pilot projects to enable safer neighbourhoods, in a more sustainable manner. Piloting any kind of project that impacts drivers stimulates very strong feedback – both positive and negative – and a tremendous volume of e-mails to our office. Many wards choose not to conduct pilots for these reasons, but I have seen much success and will ‘take the heat’ with the ultimate goal of improving our neighbourhoods.